The Meeker Mansion in Puyallup is one of the cities most treasured attractions. Ezra Meeker was a trailblazer, author and a superb salesman of the Pacific NW. Meeker is almost certainly known best for his 25 year struggle to interest the nation and particularly interest Congress to the marking of the Old Oregon Trail, over which three hundred thousand immigrants had travelled searching for a start that was fresh in the West. Long before this epic adventure Meeker had already lived a three score and ten years of purposeful and vigorous life by pioneering and leadership that made him well-known not only locally and nationally but internationally. There are very few men who have accomplished so much in a lifetime. Five long, dusty, hot and very fatiguing months they finally reached Portland, Oregon on October 1st, with only 3 dollars. They eventually settled in today’s Puyallup. It was there that Mr. Meeker staked his claim, cleared the land and then became a very influential, and one of the richest men in the state, as well as internationally and nationally famous in commercial circles. 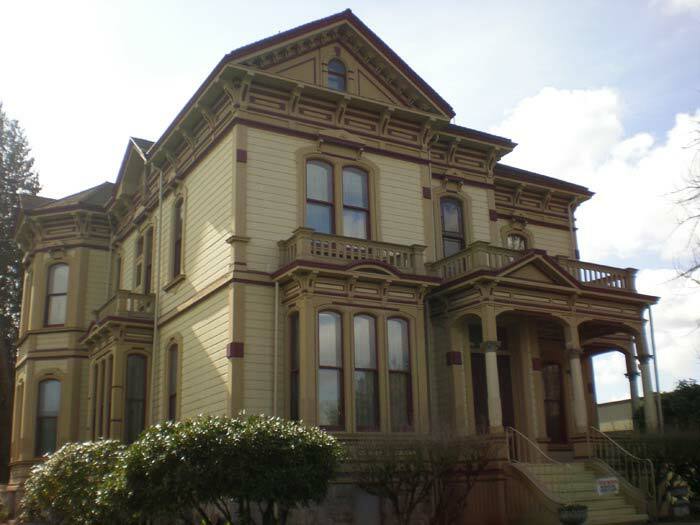 The Meeker Mansion is an Italianate Victorian mansion with 17 rooms. Located on Spring Street in Puyallup, this home built by Meeker and finished in 1890. Meeker finished building this very impressive mansion as a gift to please his wife. The home was designed by Ferrell and Darmer Architects from Tacoma. The Meeker Mansion is now owned and operated by the Meeker Historical Society which is a 300 member, private, non-profit corporation. Ezra Meeker accumulated his wealth during the 1870’s from the hops he grew in the fertile valley soil. Together with his wife’s inheritance, they had their home (today’s Meeker Mansion) built for a cost of $26,000. The mansion rooms included a billiard room and a third floor ballroom as well. It even was built with a rudimentary intercom system of speaking tubes to connect the rooms. The home was a show piece in the community, and a truly loved home of Ezra’s wife, Eliza Jane. However, within a few years, Meeker’s affluence was becoming less as the infestations of valley crops drained much of his wealth. The home was becoming a financial burden to Ezra and his wife Eliza Jane, but Ezra vowed he would not move his wife from the house she loved so dearly. The financial strain continued until Eliza’s death in 1909, but Ezra kept his promise. That same year he put the home up for sale. After years as serving as a hospital, a home for the Ladies of the Grand Army of the Republic, a nursing home, it was finally given to the Ezra Meeker Historical Society in the early 1970’s. The building was in a terrible state of disrepair. Water leaked through the ceiling into the once grand ball room. The gorgeous hand painted ceilings had been painted and plastered over. The building was an eyesore to the community. But, the society, with hard work, dedication, sweat and much manual labor, their persistence paid off. The Mansion is now on the National Register of Historic Sites, and again is the pride of our Valley’s past. The Ezra Meeker Historical Society receives NO state or federal support. It is their fund raisers, admission, and mostly hard work that preserves this landmark. 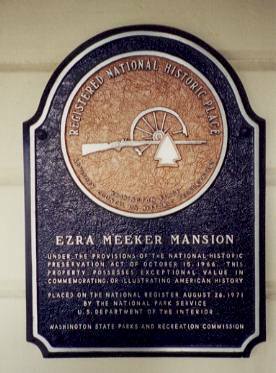 The “Ezra Meeker Historic Society” was established in 1970 to protect one of the town’s momentous historic places, Meeker Mansion. They then changed the name to The “Puyallup Historical Society at Meeker Mansion” and now are a non-profit organizationthat operates and restores both the home and the grounds. There are tours at the Mansion, both guided and self-guided as well as educational tours for students. During the year, the Mansion can be rented for various parties as well as community events and weddings. This Mansion is a must see attraction, when visiting in this area of Washington. Historic Landmark Place Meeker Mansion. Washington State. What’s with the name, Puyallup?